We are very happy to be able to announce that we have brought to Spain a new way of playing with wooden blocks: it is Luco . Luco are wooden blocks that have the superpower to connect with each other so that your little one can create with them infinite constructions, toys and objects of all kinds. 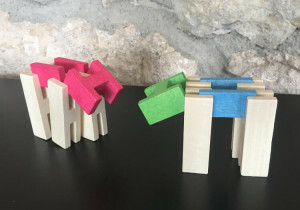 In our – JUGUEAR”S team- point of view most of wooden blocks are inconvenience and have a main disadvantage: if you touch the construction or you want to move it, everything falls down! This happens with some of the most emblematic brands of blocks like Kapla, which do not allow that once the construction has finished, the game can continue. And this is where we believe that Luco will surprise everyone. Your little one will build a lot of things with his connectable blocks and, later, he will be able to play and interact with them. If he builds an airplane, then he will fly that plane very high and walk it around the house. If you build a house, you can put animals or figurines inside to keep playing. If you build animals, you can create your own farm, zoo or jungle. If you build a crown, you can put it on and transform into whatever you want … everything is possible with Luco! Luco wooden blocks are based on 4 different pieces:a plank , a cross, an elongated H-shaped piece and a short H-shaped piece. The different pieces are intertwined between them and in this way your child does not only build , but later his creations come alive so he can play with them. By having different forms, with Luco you can build anything you can think of: small robots, animals, chairs, airplanes, rockets, houses, dinosaurs … Endless possibilities of play and fun! It is a wooden toy that enhances the imagination of your child and with whom you will have fun for hours. Playing with the blocks of Luco develops the three-dimensional thinking of your child, as well as his creativity and divergent thinking. It is a fun way to play that also involves a mental challenge and a way to feel the creative power that nests in each of us, so your little one also improves their self-esteem and their security. In addition, when you interact and experiment with the creations you have made, it is also a wonderful toy that enhances motor skills and team play, as creating and building together is always fun. Luco connectable blocks are suitable from 3 years and is a toy that your child will enjoy at different stages of his childhood. From 3 years old, he will start experimenting with simple creations and basic forms, but as he grows his creations will be increasingly complex and rich, adding everything he experiences in his day to day and that is interesting. Luco are wooden blocks with which your child will have fun until they are 12 years old ! The Luco blocks are made of rubber wood that originates from trees that no longer produce rubber, so it is considered an ecological toy . The blocks are produced with a single piece of wood and that makes them very resistant and sustainable. They are handmade and painted with water with different colors. Read here about luco toys in DUTCH: houten speelgoed blokken :Onze gepatenteerde blokken leveren veel speelplezier voor jong en oud. Dit nieuwe constructie systeem is helemaal uniek en is nergens anders verkrijgbaar.